Today we are beginning a series on the signing habits of some of the various presidential candidates. I have found most of them to be very nice people and responsive to their fans. Newt Gingrich – There is no question that his campaign for President is off to a very rough start. 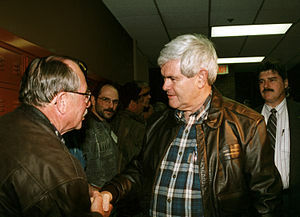 Over the past two decades, I have encountered former Speaker of the House Gingrich a dozen or so times. I have generally found him to be very accommodating and a willing signer. He has signed multiple items for me on almost every occasion. He is friendly, out going and, if he has the time, is willing to chat on any subject. This entry was posted in autographed cachets, autographed fdc, autographed first day covers, Autographs, book signings, Celebrities, Collectibles, signed fdc, signed first day covers and tagged democrat, independent, Iowa, libertian, Meet the Press, Newt Gingrich, Paul Ryan, President, Presidential election, Republican, Speaker of the House, Speakers, United States. Bookmark the permalink.